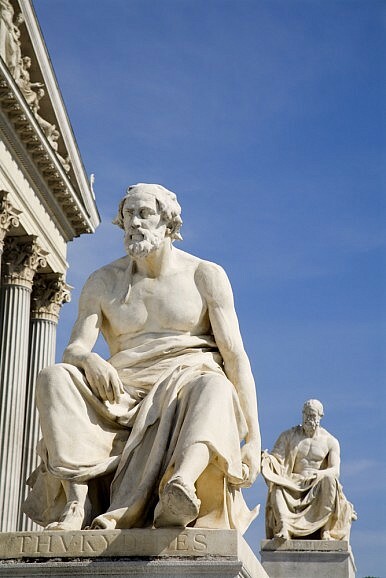 The popular expression only captures half of the true meaning of Thucydides’ work. Professor Graham Allison of the Harvard Kennedy School has popularized the phrase “Thucydides’ trap,” to explain the likelihood of conflict between a rising power and a currently dominant one. This is based on the famous quote from Thucydides: “It was the rise of Athens and the fear that this inspired in Sparta that made war inevitable.” This usage has even spread to Chinese President Xi Jinping who said “We all need to work together to avoid the Thucydides trap – destructive tensions between an emerging power and established powers … Our aim is to foster a new model of major country relations.” However, those like Graham Allison who talk about a Thucydides trap only capture half the meaning of the History of The Peloponnesian War. The true trap is countries going into, and continuing, war clouded by passions like fear, hubris and honor. If the United States and China fight a war, it will occur because of the same fear and honor that led the Spartans to start the Peloponnesian War, or the Athenians to continue it. Prominent Chinese scholar Ye Zicheng expressed this sense of honor when he wrote, “If China does not become a world power, the rejuvenation of the Chinese nation will be incomplete. Only when it becomes a world power can we say that the total rejuvenation of the Chinese nation has been achieved.” American exceptionalism, the conviction that the United States holds a unique place and role in human history, provides a counterpart to Chinese nationalism, and is widespread enough to be a central plank of the Republican Party’s platform. This strong belief of a special place in the world can make a country sensitive to insult, intended or otherwise, such as in 1999 when NATO aircraft bombed the Chinese embassy in Belgrade during Operation Allied Force in Bosnia, killing three Chinese citizens. The United States claimed that the bombing was an accident, but few Chinese accepted this explanation, and more than 100,000 Chinese protested across the country, including attacking the American embassy and consulates. Contributing to the anti-American outrage was Chinese state media insisting the bombing was not an accident. Anti-Chinese sentiment is not as widespread or as vocal in the United States, but it is common for American politicians and pundits to portray the rise of China as a risk to America’s place in the world. Leon Whyte is a second year master candidate at the Fletcher School of Law and Diplomacy at Tufts University as well as the Senior Editor for the Current Affairs section of the Fletcher Security Review. His research interests include transnational security and U.S. alliances in East Asia. MAR or War?The US Is Pushing Back Against China. What Happens If We Succeed?On Looming US-China Trade Deal, Actions Speak Louder Than WordsAmerica's China Bashers Are Gaining SteamChina Won’t Join the INF Treaty—But Can It Forever Dodge Arms Control?